Did we just live through “Crazy Pricing Week”? 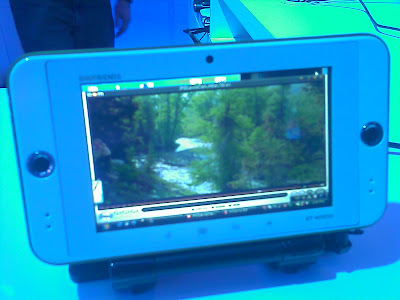 First was the Logitech Revue Google TV at $299, then the Cisco Umi home videocon came along at $599 and yesterday we saw rumors tha the Samsung Galaxy Tab might launch at $399 on a 2 year contract with T-Mobile. If that last one turns out to be accurate, it could end up as a disaster for the Samsung Galaxy Tab. As I mentioned a few weeks ago, it looks like the Samsung Galaxy Tab will not have the software and app ecosystem to compete effectively with the iPad. Heck even Google said Android 2.2 is not designed to run tablets. These issues might be surmountable if the Galaxy Tab were to be priced competitively – and I mean something like $199 on contract and say $399 contract free. The rumored $399 with a contract make it seem irrelevant, since anecdotal evidence suggests that only a small percentage of iPad owners have subscribed to the ontract free AT&T data plan, which starts at just $15 per month. The rumors also suggest that the unsubsidized Galaxy Tab might cost $649, which is slightly higher than the 16GB iPad 3G. Samsung does have a history of expensive tablet pricing. 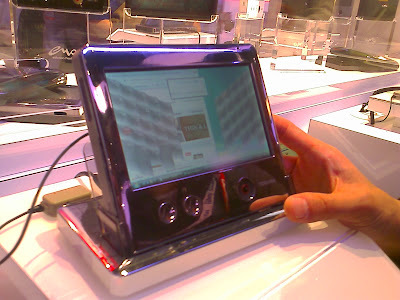 The company’s Q1 7-inch Windows XP tablet and Q1 Ultra follow-up device were too expensive to win significant consumer attention. If the Galaxy Tab pricing rumors are true, expect to see limited numbers out and about. Sheesh, that really was the week of crazy pricing. Sure sales might have been down recently due to the weak economy but the way to win back sales is surely to price appropriately and look for volume buildup rather than having to endure price cuts that anger early adopters. Apple already went through that with the original iPhone launch and hwere wise to avoid a similar pitfall with the iPad. I got some hands on time with the upcoming Atom-powered Gigabyte and Lenovo MIDs last week and I’m sure about one thing: the OQO 02 just became very overpriced. Both the Gigabyte and Lenovo MIDs are expected to come in around $500, albeit running Linux. They both have usable, if very different, keyboards; they’re both eminently pocketable and both have Intel’s super-efficient Atom CPU which means tons of battery life. The Lenovo unit I played with even had an Olympic paint job; cute. Who are they for? No-one really knows yet, but they’ll definitely appeal to the people who are (not) buying the OQO 02 and Samsung Q1 Ultra these days. The 02 is still languishing around the $1,800 mark. The Q1 can now be found knocked down to $800 or so. Neither is likely to match the atomic (pun intended) battery life of the Gigabyte or Lenovo MIDs, which is critical for a pocket computer. Will there be Windows versions of these two MIDs? That’s not known as yet, but I don’t think it’s inconceivable. The Atom is certainly capable of it so I’d expect at least to see fanboy photos of Windows booting on one of these units soon after release. The actual models I tested had modified Linux front ends which are cost effective, but the practical and performance advantages over XP remain unclear. 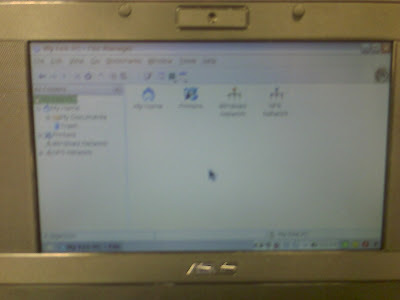 My EEE 2G boots Linux in 25 seconds, but the XP version is not far behind. In fact the cost advantages are only partial these days, as Microsoft recently reduced the license cost for XP Home on ultra low cost PCs. The Linux implementations on these units was okay with some sweet touches, for example the Lenovo employs an easy swiping motion to scroll through home screen icons. It also has a Mozilla browser named Coolfox – dig the family name. Having played with a gazillion different Linux front ends now, it would be nice to see a standard emerging. Perhaps we’re still a bit early for that but hopefully it will come in a couple of years. If this doesn’t happen then ultimately the consumer will suffer from having a learning curve attached to each manufacturer’s devices…a bit like cellphones but oh so much deeper. Did either of the two capture my imagination? I preferred the Gigabyte’s keyboard layout and overall format, whilst the Lenovo is probably a younger choice aimed at pure surfing and messaging with it’s cellphone style keyboard. The full size SD slot on the Lenovo also gives huge expansion potential, compared to the Gigabyte’s micro-SD limitation. Whether either of them can be successful will depend on persuading people away from buying an EEE-type mini laptop which all offer a bit more (but in a bigger box) for less money. Look at it another way: Five years ago everyone had desktops and no-one could persuade consumers to buy a laptop second PC. Now everyone has laptops and the 2006-07 challenge was to get people in the mindset of wanting something even smaller. That seemed impossible until the EEE came out and busted out everyone’s perceptions. Now Acer, Dell, HP and MSI are jumping in because it’s going to be a huge market. The same will happen with MIDs once the EEE-format market matures. So although hordes of people won’t be running out to buy one of these MIDs just yet, recent history suggests that we will in a few years time. Hang in there MID fanboys. This fantastic looking Aigo UMPC echoes the recent Nokia N810 with a slim form factor, large screen and excellent sized keyboard. 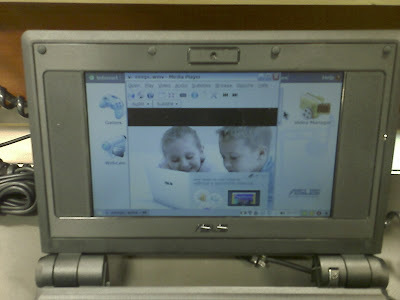 This Aigo has one of Intel’s new Silverthorne / Menlow processors and the display model was running Linux. Given that the Silverthorne goes up to 1.6 GHz, The Aigo’s implementation of screen, keyboard and power make it one of the most promising UMPC designs out there currently. Lenovo’s U110 is a stunning 2.4 pound ultraportable with an amazing 8 hour battery life. 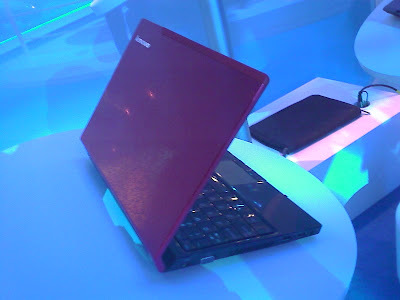 The beautifully patterned red lid is striking and Lenovo had made a great effort to make the keyboard user friendly with large keys. The U110 will be available with an Intel Core 2 Duo processor, choice of 64 or 32 GB SSD or regular 160 GB HD and a 11.1 inch screen. 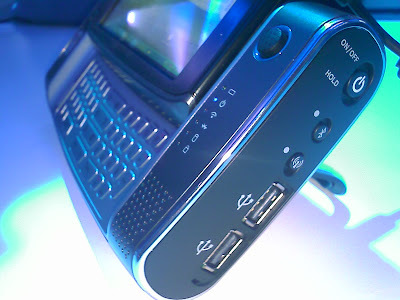 Communication features include bluetooth, WiFi and a 1.3MP camera. The ultra-thin design ranges from 0.7 to 0.9 inches at the thickest point. This dream machine will be available in April priced at around $1,800. 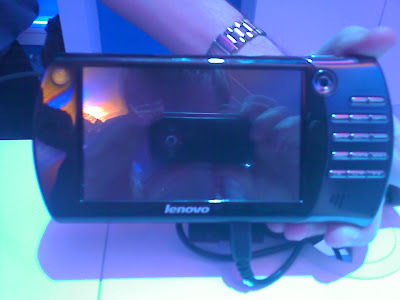 Lenovo also showed a Linux based UMPC with an interesting form factor. 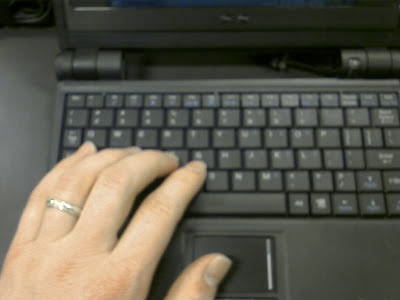 The keyboard to the right of the screen sports a mixed key use arrangement. This is currently a prototype with no production details available. 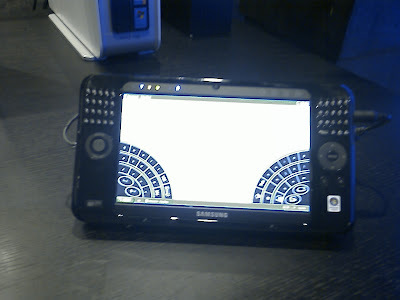 Samsung previewed an ingeniously designed prototype WiMax UMPC. 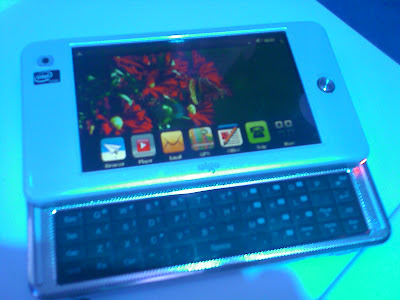 Looking at first glance like a regular small tablet device, the bottom half actually folds out in a butterfly motion to reveal a keyboard, double the width of the chassis. 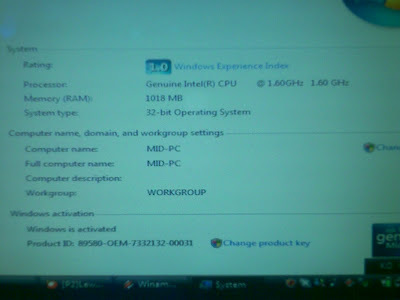 Specs include a 1 GHz Intel CPU and 30 GB hard drive. This is the best UMPC keyboard design I’ve seen so far. Samsung also expanded its Q1 range with the launch of the Q1 Ultra Premium. The Q1’s thumboard, which I have generally found difficult to use, has been supplemented with a large software keyboard. Dial keys is gone. The Q1 Ultra Premium will be available with a 64 GB SSD and has a range of Intel processor options from 1.06 to 1.33 GHz. A Samsung representative said the current Q1 Ultra range would continue to be sold for the time being. The Amtec U650 has again a different form factor, where the screen slides up to reveal a well designed thumboard. 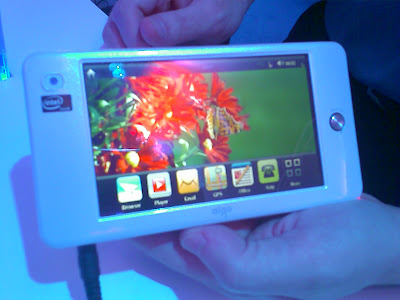 In the face of competitors from Aigo and LG, the unit feels pretty chunky for something with a 5.6 inch screen. Sony has updated its Mylo communicator, which comes with Skype preloaded. This Digifriends WiMax equipped UMPC has a range of available accessories, including a snap-on keyboard. 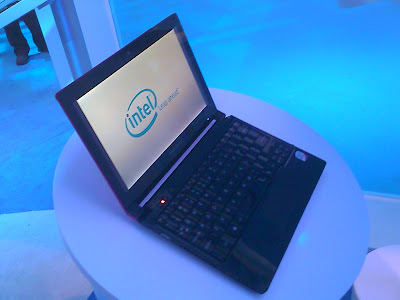 It also uses Intel’s new Silverthorne / Menlow CPU range which goes up to 1.6 GHz. 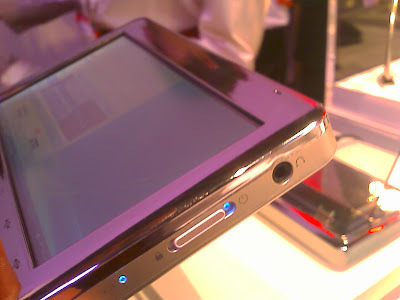 Finally Toshiba’s eMotion Feel UMPC is yet another different form factor proposition. Currently a working concept, the eMotion Feel looks expensive and heavy but amazingly weighs under one pound. 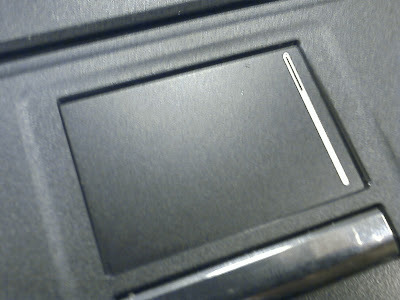 The front panel’s pointer and buttons seem limiting as the main controls, along with a stylus. 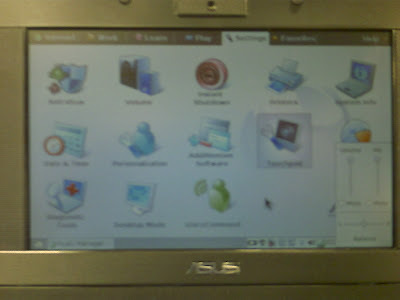 Its unique feature is tilt scrolling, which is activated by pressing a button on the left side and then holding the unit at an angle to scroll through a page. An interesting and intuitive design feature. 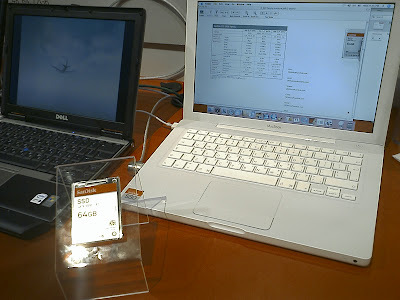 My CES 2008 news update comes in the following sections: Laptops & UMPCs, Home Entertainment, Media Players, Cellphones, Gaming and Trick Technologies. To read all the CES 2008 articles, click here. Details of dates, pricing and specifications described below are given from the best information available at the time of writing and may change at any time at each manufacturer’s discretion. Sandisk, Samsung and Toshiba were all showing off their Solid State Drive technology. 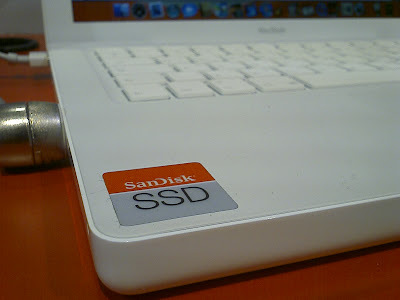 Sandisk had several laptops on its stand fitted with SSDs including a MacBook, although this was a working concept rather than a production unit. Samsung were running a video showing the relative merits of SSD versus traditional hard disks, which highlighted SSD benefits in file access timing, battery performance and vibration tests. The company, which has been fitting 32GB SSDs into production Q1s for a while, announced that a 64 GB SSD version will be available in the new Q1 Ultra Premium range. 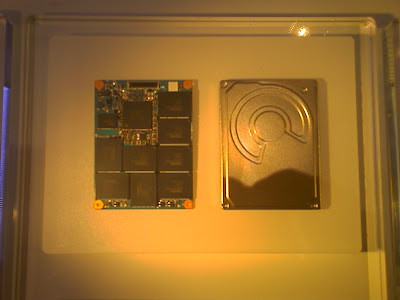 Toshiba had an open SSD on display and as expected the drive simply looks like a large memory board with an array of storage chips in place of a traditional spinning platter. I would expect SSDs to become an ever increasing part of portable commputing and to fall in price as production volumes increase. Killer SSD fact: SSDs are governed by Moore’s law, which states that the number of transistors on a chip doubles about every two years. 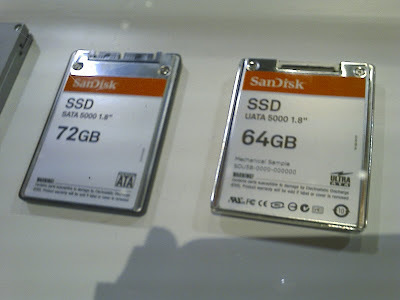 We could therefore assume that at a given price point the capacity of an SSD should double every two years. Or, the cost of a given SSD capacity should roughly halve every two years. This means that at some future point I expect SSDs to become cheaper than traditional hard drives and therefore more widely implemented given the relative benefits of SSDs. 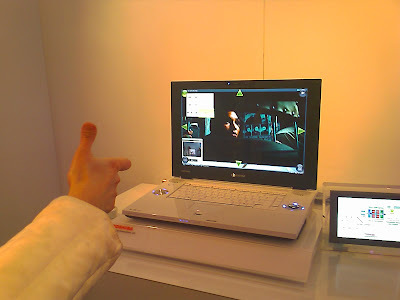 Giving us hope that Minority Report style hand waving technology may be possible one day, Toshiba demonstrated a prototype Qosmio laptop which responded to hand gestures. By making certain gestures in front of the laptop’s webcam, the demonstrator was able to play, pause and search through a movie. Another gesture turned the hand into a vitual pointer, controlling on-screen mouse movement. This was made possible by development of Toshiba’s SpursEngine, a co-processor which takes processing of certain highly data intensive functions away from the CPU and graphics card. This allows the latter two to concentrate on what they are doing and gives the overall system more horsepower for rendering HDTV and certain other multimedia tasks. The software is already compatible with Windows Media Center. The best news about this technology is that we could see Qosmios rolling into stores with it onboard as soon as this year. External drives are great…until you want to access them on the move at which point you wish you’d bought a laptop with a bigger hard drive. Not for much longer. 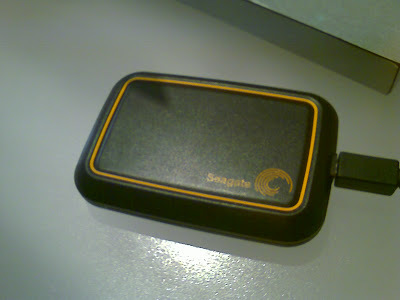 Seagate demonstrated a prototype 1.8 inch external hard drive called the DAVE equipped with WiFi and a battery (rechargeable via USB). 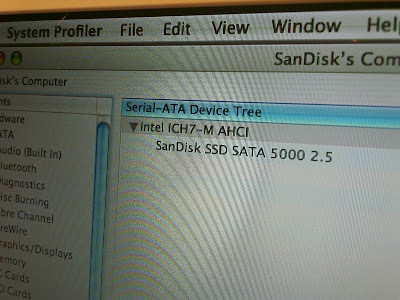 So this drive could stay in a bag whilst you access it from a laptop on a coffee table nearby. Seagate is aiming to give it cellphone-like battery life. It is unlikely that Seagate will sell the drive themselves just yet, at present the company is working with third parties to build software and market the product. This technology, once emerging, has now definitely emerged and is retail stores. OLED screens were some of the stars of the show, with dazzling screens on display from Samsung and Sony. See the home entertainment section for more details. See photos and read CES news about: Laptops & UMPCs, Home Entertainment, Media Players, Cellphones, Gaming and Trick Technologies. To read all the CES 2008 articles, click here. After weeks of low supply, the Asus EEE PC has finally appeared. I spent some eagerly awaited quality time with the small, cute and cheap 4G model. 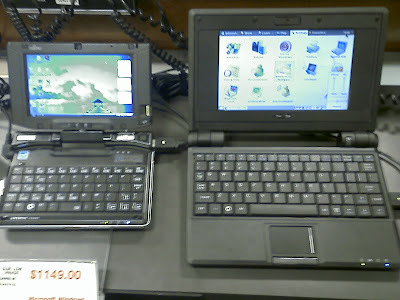 Next to a regular ultraportable the Asus EEE PC is noticeably smaller. It´s also thinner, most likely due its lack of optical or mechanical hard drives. It does however still manage to pack in a VGA output, Ethernet port and 3 USB 2.0 connectors without needing a port replicator. The screen is also smaller than most ultraportables at seven imches, the same size as Samsung’s Q1 series. However in the case of the EEE this seems to be to keep the cost down than anything else. The lid can actually accommodate a couple more inchesof screen space and the resulting look is of a laptop from the mid 1990s with a wide screen border. The keyboard is also a shrunken affair but is surprisingly easy to use. I was able to type lines of text accurately without any need to acclimatize. This will depend on finger size but I was pleasantly surprised. For such a thin laptop the keys also have a positive feel with a decent amount of travel. 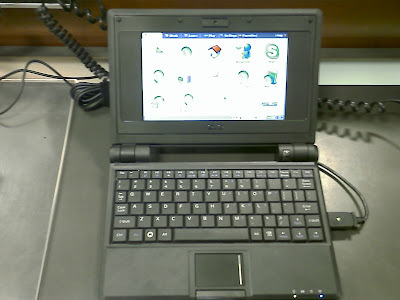 The EEE PC has a traditional trackpad which has a separated section on the right hand side. Using the media player this section controlled playback volume. The trackpad was fairly responsive to movement but less so to taps, although it is usable. There´s only one button, like a Mac, but improving on Apple’s design the left side of the button gives a left click and the right side gives a right click (thanks for the pointer Neil). Great idea and works well in practise. 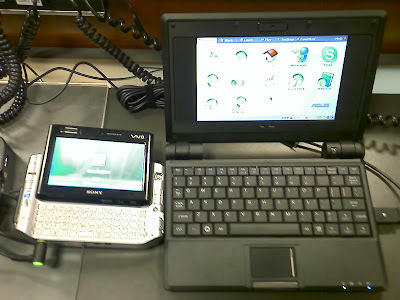 In comparison to competitors, the EEE dwarfs the Fujitsu U810 (above) and Sony UX380N (below). These both have smaller screens and keyboards also, as well as oddly placed mouse control, to the extent that they are really for emergency use in my opinion. Samsung´s Q1 has the same size screen but an almost impossibly small thumboard, although for desk use you could always add an external keyboard. All three competitors are far more expensive than the EEE PC. The colored EEEs are now available, click here for photos. It’s cheap, but can I actually use this thing in real life? Switch on the EEE and it boots quickly (I counted 24 seconds) into a home screen with big icons and tabs. It looks ultra easy to use and find what you want. In this regard it’s similar to the iPhone home screen. But then I always thought the iPhone home screen looks simple because it only has a few preloaded applications. The EEE is similar, with limited applications it’s easy to give everything a big icon. I expect most owners will never add any applications anyway, as much of what you need to get going is included right out of the box. The EEE ships with internet, office and media playback software sitting on top of its Linux operating system. The look and feel is overtly Windows XP and when I was using the file explorer I actually had to do a double-take to check I was not using an early shipment of XP preloaded EEEs. Following years of anti-Microsof sentiment from some corners of the IT community, it is somehow ironic that Windows has become so popular that competitors either mimic it or allow users to run it on their own environment to attract switchers. Using the internet browser will be straightforward for most owners, with the exception that some sites optimized for Internet Explorer may not work properly. I occasionally find this on my Macbook and Nokia tablet with their respective Safari and Mozilla browsers. Similarly the office software is not Microsoft Office so again there may be compatibility issues if you are trying to share files with MS Office users, although some common file formats are supported. The media player is also less friendly than iTunes or Windows Media Player but is usable nonetheless. All of this of course results from the low cost of the EEE. Building a Linux system is much cheaper than building a Mac or Windows system. Unfortunately file, application and peripheral compatibility is where you ultimately pay for this. So make sure that whatever you want to do is Linux compatible before you purchase your EEE. The alternative is to either install Windows (which can be done by running the installation from an external drive), or wait for the Windows preloaded version to be released. Of course this will have a cost implication and if you then want to run Microsoft Office then this is another $150 as a home user. 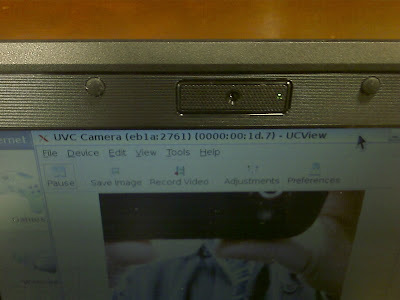 The EEE PC 4G’s lid houses a webcam. This is missing from the cheaper models in the range, but a fantastic feature to have if you can afford a higher end EEE. 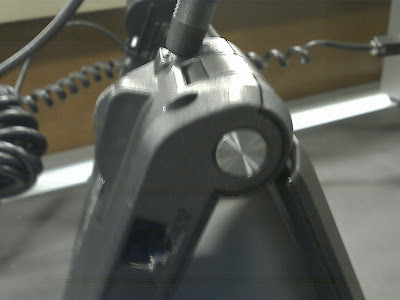 The quality of the camera is on a par with similar devices in other laptops. Every laptop should have one of these! EEE owners are likely to take their units around with them due to the small sixe, so how is it likely to stand up to road use? First impressions are that the EEE seems well built with an assuringly solid looking hinge mechanism. Apart from this and the keys, the EEE is pretty low on moving parts. There are no mechanical hard or optical drives to break in transit so some risk associated with traditional laptops is not present in the EEE. Of course it is still vulnerable to failure like all electronics, but hopefully Asus’ choice to go for a solid state drive will save many a users’ data on a bad day. So is it the bEEE’s knEEE’s? If you’re a light, or adventurous, user then don’t let my compatibility comments put you off. For mobile corporate users running thin client software this is also a winning solution. It’s the middle tier of users I think are likely to struggle. These are the people who want to do funky things now and again and might not have the knowledge to do it quickly in Linux. If you’re one of these people then you may prefer to wait for the Windows version. May 2008 update: Read the Asus EEE 900 vs HP Mini-Note 2133 comparo here. Jan 2008 update: As predicted above, others have followed. Read about Everex’s $399 here. For details of the new Asus R50 UMPC, click here. James Bond’s Q was capable of many wondrous things, but unlike many of his fictional works, Samsung’s Q1 is a wondrous work of fact. 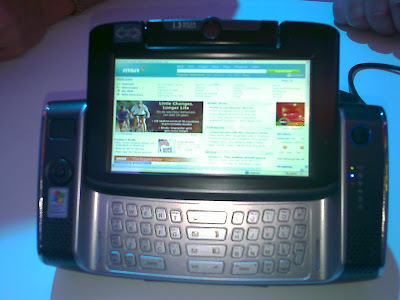 That fact, unfortunately, was that the Q1 Ultra really struggled with Vista. Going to the Samsung Experience at the TWC a few months back, the painful memory was of a killer device killed by its own CPU/OS combination. The Q1U had a couple of other flaws like the Barbie-small keyboard (see photo) and high price, but the basics like watching smooth video and loading up Control Panel in a reasonable time were scarily lacking. Vista was weighing heavy on its mind. What a difference a difficult-to-stomach-but-sensible downgrade makes. Now that the Q1U comes with either Windows XP Tablet 2005 or Vista Premium, I decided to take it for another test drive. With XP the Q1U simply flies along. Video is smooth, web pages load quickly and battery life gets a boost to 4.5 hours according to Samsung. 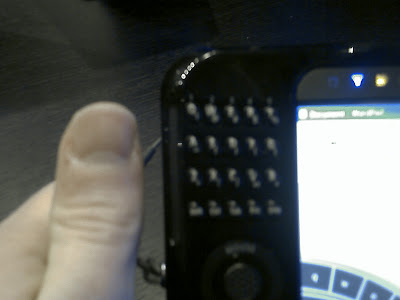 I even gave the thumboard another try which, whilst not as tactile as a Blackberry or my HTC TyTN, does a reasonable job once you get used to it. It’s definitely usable and the Q1U would be a great tool for applications which require mainly mouse manipulation with some text input, such as presentation building. I still haven’t clicked with Dial Keys though! With XP this is really a device that Q would be proud of; especially now he can watch Bond without freeze frame explosions!